If you need high quality backlinks then use our service to rank your website, ranking and give more power to your website. 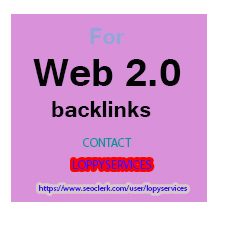 GET POWERFUL100 WEB 2.0 WITH HIGH AUTHORITY DO FOLLOW BACKLINK TO RANK YOUR WEBSITE is ranked 5 out of 5. Based on 12 user reviews.